If you are interested in adding a beneficial herbal supplement to your health routine, you should look into ginger essential oil. The use of ginger, the underground stem of the Zingiber officinale plant, dates back to Indian, Asian and Arabic cultures of ancient times. Ginger best thrives in moist, tropical soil and is not only used as an alternative medicinal therapy, but is also a popular cooking seasoning. There are many reported ginger benefits related to a variety of health conditions. Before you decide if ginger oil is right for you, take some time to research all aspects of a ginger oil regime. Start by reading this list of ginger essential oil uses. – Motion sickness. Ginger has shown signs of markedly improving signs of motions sickness such as nausea and cold sweating. – Inflammation. One of the reported health benefits of ginger tea and other ginger supplements is its effectiveness in reducing chronic inflammation, such as that caused my arthritis. – Nausea associated with pregnancy. Pregnant women report less nausea when given ginger pills for a period of four days. 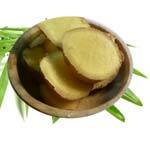 However, the safety of ginger in pregnant or nursing women is not guaranteed for a period of longer than four days. – Heart and vascular health. Preliminary studies on the tie between ginger and blood pressure suggest that ginger may lower cholesterol and prevent blood clots, thereby improving blood pressure and flow. – Nausea associated with pregnancy. Pregnant women report less nausea when given ginger pills for a period of four days. Additionally, there are less ginger side effects than there are side effects with traditional prescription nausea medications for pregnant women. – Relief from discomfort caused by chemotherapy. Ginger essential oil has been reported to ease nausea and upset stomach in chemotherapy patients. – Surgery-related nausea and vomiting. Patients who take ginger after surgery report having to use less anti-nausea prescription medication. Once you decide that ginger essential oil is right for you, it is important to consult with your doctor before introducing the supplement into your diet plan. As with any herbal medicine supplementation, you should be aware of the benefits, risks, side effects and dosing recommendations associated with a supplement before taking it.